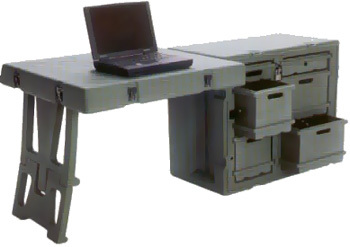 When office and/or computer work is required in the field, ETI�s Tactical Field Office� provides one, two or more individuals with work spaces, storage drawers and quality power options regardless of the location. Tactical Field Office is a deployable office system that includes a Tactical Desk� that can be equipped with a Global Power Conditioner, Global UPS and/or Notebook PowerStation�. The Tactical Desk quickly and easily fold into one durable shipping container. 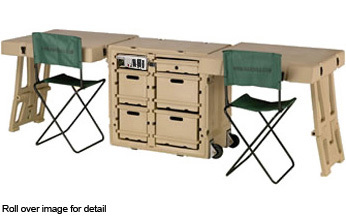 To make the Tactical Desk a complete field operation office, one or two sturdy field chairs are included depending on configuration.